Michelle Wie may be forced to go to Q-School if she doesn't earn enough money to finish 80th on the LPGA money list. EDINA, Minn. » Even in some of her lowest moments in golf, Michelle Wie never had so little to gain. She had to return to Interlachen at dawn yesterday to play one hole of the rain-delayed second round at the U.S. Women's Open, no chance of making the cut or even breaking par. From an elevated tee, she gazed down at a gorgeous view of the sun casting its morning light on the ninth fairway. But when play resumed, her tee shot strayed some 30 yards to the right into the shadows of the trees. Such is the plight of someone who once brought so much sizzle to her sport. What looks like hope can turn so quickly into hardship. Wie went from finishing second in a 36-hole qualifier for the U.S. Women's Open to opening with an 81 and making the news that night only because of a quintuple-bogey 9 that all but ended her chances. One week after her best finish on the LPGA Tour in two years, she had another weekend off. "It doesn't feel like I played that bad," Wie said after scrambling for a par on No. 9 from about the same position where she made her quintuple bogey on Thursday. "I'll just take this as a bad week and go from there." Where she's going is anyone's guess. The wrist injuries that made a wreck of her 2007 season have just about healed. Wie showed no sign of pain for two days at Interlachen, and any questions about her power might have been answered on the 17th hole. With the tees moved up to make it play 405 yards, Wie smashed a driver over the bunkers and had a 52-degree sand wedge left to the green. For someone whose psyche was so fragile last year, confidence is slowly being restored. Even after opening with an 81, she was 1 under for the second round until the storms rolled in Friday afternoon and stopped her momentum. But the next month is critical. 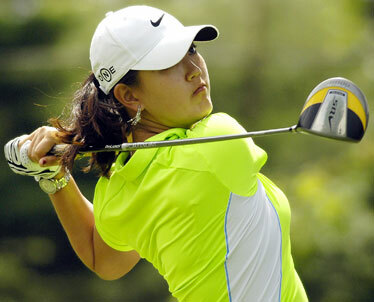 The 18-year-old from Honolulu was once somewhat dismissive of the LPGA Tour. Now she's desperate to join it. Wie has only three sponsor's exemptions left this year, and she likely will need to finish in the top 10 at all of them to earn the equivalent of 80th on the LPGA Tour money list and get her card. Otherwise, Wie could be headed to the first of two stages of qualifying. "I think the qualifying conflicts with school, so I probably won't go to that," Wie said earlier in the week, noting it was tough to take one week off at Stanford last fall to play in a tournament. "But hopefully, I'll make enough money this year to get exempt for next year. I'll see how it goes. I'm having a lot of fun playing good again, so that's all I'm focusing on now." However, her father made it sound as though Q-school was a distinct possibility. "What other options do we have?" he said. The only time Wie had to qualify for a regular LPGA Tour event was the Takefugi Classic in 2002 when she was 12. Exemptions started pouring in after that, and Wie brought so much excitement to the LPGA Tour that rules were changed to allow her to play as often as possible. Instead of a minimum six exemptions, the LPGA stopped counting the U.S. Women's Open and Women's British Open against her limit. The LPGA Championship made an exception in 2004 for a leading amateur -- Wie. She remains one of the biggest attractions in women's golf. There is no shortage of tournaments that would love to have her. Why not spend another year taking exemptions? "This is no longer the right time for that," B.J. Wie said. "That was for high school, not college. We extended that one year because of the injuries." Q-school would not be the worst option. Karrie Webb won the Women's British Open in 1995 at age 20, came to America and earned her card at Q-school despite playing with a broken bone in her hand. She now is in the World Golf Hall of Fame. Morgan Pressel made it through Q-school when she was 17, and a year later became the youngest player at 18 to win an LPGA major. Paula Creamer started out in Q-school and now has five victories. There is work to be done, and there were times when golf looked like anything but fun to Wie. Four hours after she signed for her 81 on Thursday, she had changed clothes and was going through a drill on the putting green. Eight tees were placed around the cup, some 15 feet away, and Wie worked her way around the circle. If she missed the putt, the tee stayed in the ground. Make it, and the tee comes out. She couldn't leave until all the tees were gone. Wie lined up every putt as if it were the 72nd hole of a major, sometimes slapping her knee when the putt burned the edge of the cup and stayed out. When she made one, she snatched the tee out of the ground and angrily threw it toward her bag. This did not look like much fun. When all the tees were gone, she walked up the hill with her head down, the brim of her cap hiding her eyes. Then it was off to the practice range, her mother bringing over a large bucket of balls. The joy comes from shooting lower scores, and Wie received a jolt of confidence on the Ladies European Tour a month ago when she finished sixth in the Ladies German Open with a 14-under 274, seven shots behind the winner. "It had been a long time since I shot 14 under," she said. "It was like the light bulb switched on." Her hope now is to keep it flickering.